Q. Can you please show me where I can look for a journal that I need? At the bottom of the page, in the first coloumn click on Journal Titles. This will take you to a search engine. 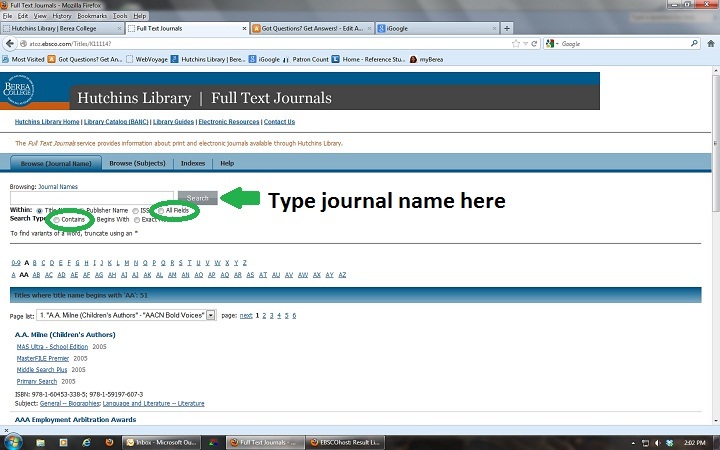 Type in the name of the journal for which you are looking. Beneath that choose "all fields" and "contains." By doing this you broaden your search. Once you have done this, hit "search." Your search will take you to a page that lists all of the sources that Hutchins Library has. These will be both online and print. Read carefully the dates for each source. If it says "Embargo: 1 year" it means that the library has access to these sources one year after they have been published. Many of our print sources are only available through the early 2000's as well. Continue your search for specific articles via BANC or the online journal databases. For more search options and instructions follow the link to the Full Text Journals help page.